Hello crafters! 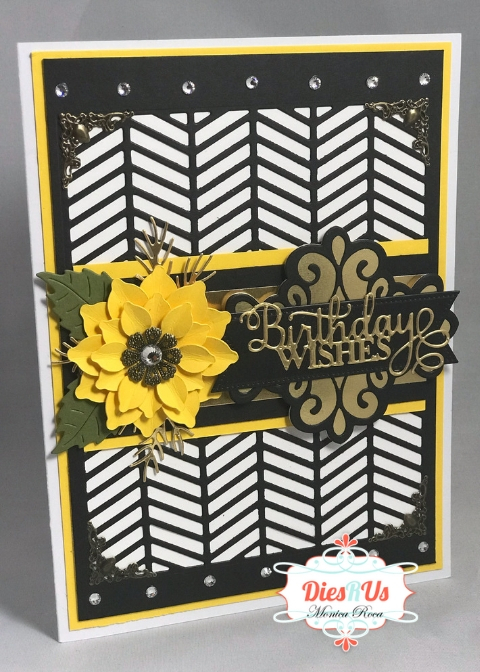 Monica here, and I am up on the blog today to share my latest card using some fabulous dies found over at Dies R Us. For todays project I wanted to use a nice and bright color since it was a cold and rainy day when I was creating this and all I was thinking about was the sun! As always I have created a quick youtube video for you where I go over all of the dies used and all of the specifics of my card. The video will be listed below the photo. So with out further delay here is my card! Hope you enjoy! Gorgeous card and I love the color combo! This is so beautiful Monica!! Great card!! What a beautiful card! I love the bright yellow flower.